I had a friend contact me who was very new to biking and she wanted to experience her first off road (tar) mountain biking experience, here our story and experiences. Just 45km from the the city centre of Cape Town, and on the main R27 road heading north along the Atlantic and up the coast you find this wonderful Keoberg Nature Reserve. A fairly newly proclaimed reserve by Eskom in 1991 (South African power utility) The reserve covers some 3000 hectares and boasts an abundance of game. On our cycling day tour we saw zebra, springbok and eland. Not to mention the prolific bird life flitting around the fynbos. On entering the power station property we were met by a friendly gate guard who requested my drivers license but any form of identification will do. Once this was done we drove to the main parking area and I was surprised to see all the cars with bike racks and loads of people running around. What caught my attention were the different families, either leaving together or coming back from their mountain biking experience. Just off the parking area are well maintained toilet facilities should they be needed. Cool so no maps or diagram of the area...but who needs this when everything is well sign boarded. I wasn't sure how long the routes will be but decided to go with the flow and really, how long can they be. Leaving the parking area via a tarmac path, the route swings north going past the nature reserve conservation building and fire department, before it turns right towards the conference centre. It was here that we spotted our first group of zebra out grazing in the distance. Heading now east we passed many families out enjoying the fresh air and wild life. It was not long and our route then heading north and our first gravel road running parallel to the main R27. Being July, Cape Town receives it’s main rainfall and we had many a puddle to negotiate, it was great seeing the bush so green and views of Table Mountain in the distance. Sammy my friend who had very little biking experience started to lag behind and I needed to show her the gears and how best to select for the current terrain. No big train smash, just by doing and feeling the difference while pedaling made for an enjoyable learning experience. At this stage we came across a signboard which showed either hang a right and do the Dikkop HikingTrail of either 14.5 or 17.5km…..we decided to stick to the MTB track of 10.6km to go and worked our way slowly back to the start. Getting to the next signboard we had the choice of going north (right), straight ahead down to the beach, or left (south) back to the car park, we opted for straight ahead with an added 4km which took us down to the beach and an awesome view of Table Mountain. I must admit, today was fantastic, the weather couldn't be better and Sammy had a blast of an experience doing her first ever “Off Road” mountain bike ride. 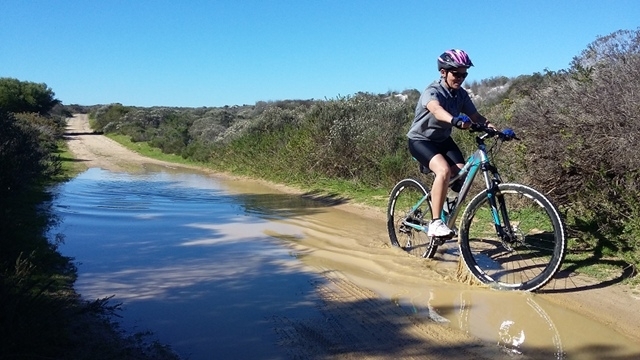 Here some more info regarding the Koeberg Nature Reserve MTB Route. If you are interested in doing any of our Cycling Day Tours please do not hesitate to get in touch. We would love to hear from you.